Broadly performed by an exuberant cast, this amusing 30-minute sketch comedy show is a clever comic pastiche of the plays of Tennessee Williams. Idiot dug up Tennessee Williams’ grave. Inside, they found something truly remarkable: his skeleton. They also found a previously undiscovered work by the master himself. seven years before the opening of the first franchised Kentucky Fried Chicken restaurant. This announcement is made by the sketch comedy group One Idiot’s “Artistic Director” at the beginning of their What the Horse Saw. 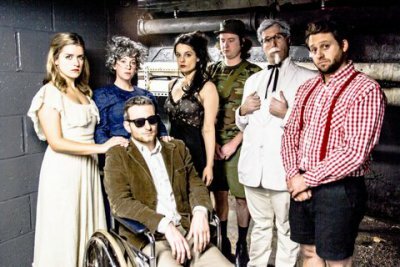 The amusing 30-minute sketch comedy show is a clever comic pastiche of the plays of Tennessee Williams. The Glass Menagerie, A Streetcar Named Desire and Cat on a Hot Tin Roof are heavily referenced. The stage is bare except for a small table and two chairs and a gallery of wacky depictions of a number of Williams’ characters parade around during the show. Amanda Wingfield, Big Daddy, Maggie the Cat, Blanche Du Bois, Stanley Kowalski, Tom Wingfield and Brick all make appearances. The collaborative script is by the One Idiot troupe’s writers that include Jon Bershad, Aaron Burdette, Allie Kokesh, Kristy Lopez-Bernal, Nathan Min and Katelyn Trela. It’s a smart mash-up of plot points and characters that those familiar with Williams’ play will recognize and those who aren’t would still find funny due to the franticly goofy presentation. The writing is also characterized by an abundance of vulgarity and scatological humor that is relatively tame rather then being offensive. The plot involves the impending wedding of a Tom/Brick scion of a fried chicken restaurant chain ruled by Big Daddy in the form of Colonel Sanders. The bride’s mother is an Amanda Wingfield-like tyrant threatening her Maggie and Blanche-type daughters with lobotomies à la Violet Venable in Suddenly, Last Summer. Comical complications are rampant. The exuberant cast is comprised of David Ebert, Maggie Ross, Caroline Cotter, Carrie McCrossen, Andrew Ashbrook Freed, and Davram Stiefler. They gleefully embrace all of this silliness with a variety of flamboyant costumes, broad characterizations and wild Southern accents. Director James McCarthy’s fast-paced staging realizes the absurdity with well-timed verbal and sight gags that achieve the intended comic intentions. What The Horse Saw is a literately zany spoof that’s in the spirit of The Carol Burnett Show movie parodies though contemporarily more outrageous. Running time: 30 minutes with no intermission. What the Horse Saw is performed on a bill with another varying 30-minute show. Unfamiliar and unusual one-acts from the last year of the playwright’s life: a cynical fable and a Grand Guignol example of Theater of Cruelty. Another sensitive play about coming of age and seeking love by William Inge fails to come into its own even using the original script.